Martin and his rather delectable 700 litre vat! Shrewsbury based Mr Moyden, aka Martin and Beth were good enough to allow us to drop in to see them on the way to Nantwich last week. Mr Moyden makes four exceptionally good award winning unpasteurised cheeses: Wrekin Blue, Wrekin White, Newport and Newport 1665. Beth and Martin had previously come to see us at Hawes to gain some ideas for their new premises and we went to see them, partly to say hello and catch up and partly because we thought we could learn from their new premises as we are finding ourselves increasingly cramped in our place. Fine Foods, a food group representing regional food and drink producers from Shropshire, Herefordshire, Worcestershire, Staffordshire, Warwickshire and Birmingham and the Black Country. What a great place! Proper food grade floors and drains, a separate lobby/entrance, a store for dry goods such as cardboard and consumable items and large office for all the admin and paperwork and lots of maturing rooms. Both Lydia and I were very impressed with their premises, we were very envious in fact, and came away with a lot of thoughts and ideas about our next premises. Mr Moyden has a large rectangular space with a big cold room in the middle, making a ‘u’ shape of the rest of the building, with two other maturing rooms, including one for their blue cheese. How about that for a maturing room? They have a fabulous wooden cased 700 litre vat with cutters and stirrers, some vertical screw Dutch presses, curd tables and an impressive array of moulds. The 700 litre vat is completely manageable by one person and made Lydia and I wonder about ours. Our 700 litre vat is very high, too high for us to bend over comfortably to cut and clean down, whereas Martin’s vat was a great shape and size. 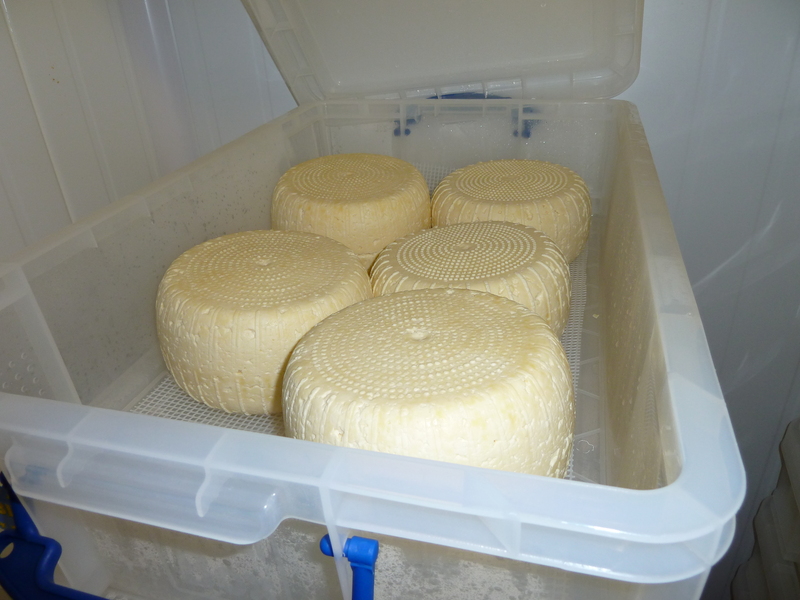 They also have a small trial vat to make soft cheese and even yoghurt. Good luck to Martin and Beth, we really wish them well as it is clear that they have invested a lot of care, time and money in their new premises; I am sure that they will grow and grow! Look out for Mr Moyden’s cheeses!